If you are an athlete and you are overweight, you need to lose weight, but without suffering a reduction in your athletic performance. For this, you need a special menu to implement the diet for overweight athletes, which includes both weight loss, as well as the individual requirements of energy, nutrients, vitamins and minerals. You can guide this example of a low calorie diet for endurance athletes. A person who practices endurance sports, such as athletes, requires a series of nutrients in order to achieve their best performance. This situation looks complicated when you need to lose a few extra pounds. Therefore, it is necessary to keep in mind that although a person who does sport needs to achieve an ideal weight, he also needs his body to be prepared for a better performance, for this purpose a special menu must be established. Here is an example of a low-calorie diet for endurance athletes. 2 glasses of fresh water just after getting up. 2 cups skim milk with cereals or 2 slices of toasted whole wheat bread with 1 egg or 1 piece of 30g of firm dough cheese. 1 fresh fruit or 1 glass of juice. 2 slices of whole wheat bread with honey or 1 bar of energetic cereal with 1 banana. 100g beef or chicken or 250g grilled or steamed fish or 2 eggs with 30g of dietary cheese. 1 cup brown rice or pasta or 2 medium potatoes. Salad of green vegetables to taste. 1 fresh fruit or 1 cup fruit salad with 3 tbsp of nonfat yogurt. 1 slice of whole wheat bread with honey. 30g cheese or 1 fat-free yogurt or 1 cup of skim milk. 100g beef or chicken or 250g grilled or steamed fish or 2 eggs with 30g dietary cheese or 1 can tuna without oil. 1 cup of tea or coffee cut with skim milk. Consume half a liter of skim milk a day, to have a good supply of calcium. You must respect the schedules of the meals, the foods must be consumed between 2 or 2½ hours before the training. Increases the consumption of whole grains if necessary, to increase the glycogen before the competition. Avoid fats and fried foods. 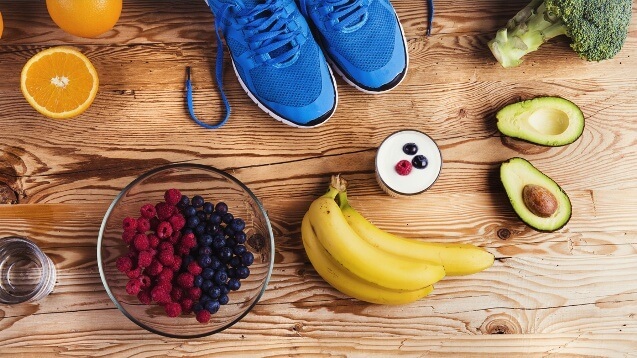 This example of a low calorie diet for endurance athletes can help lose weight without losing energy for better athletic performance.